Chicken stock—fresh, frozen or cubes…it’s all good. 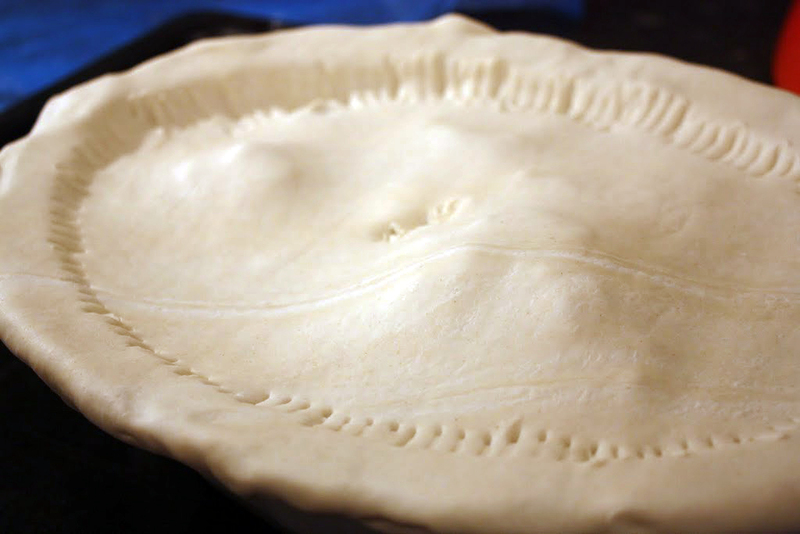 When it’s getting dark a little earlier, and things are becoming a bit drizzly and cold, it’s time to make a pie. I suppose that pie-making is a good way of embracing hibernation rather than berating the end of summer. 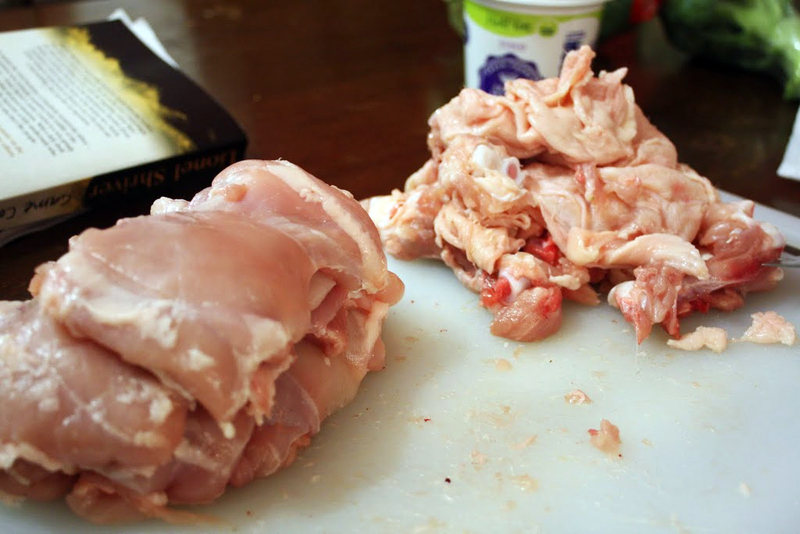 Before I start this (otherwise very easy) recipe, I have to admit that I’ve over-complicated it for myself by going off chicken breast altogether. I love the tender, brown thigh meat—it’s so much jucier…and cheaper. 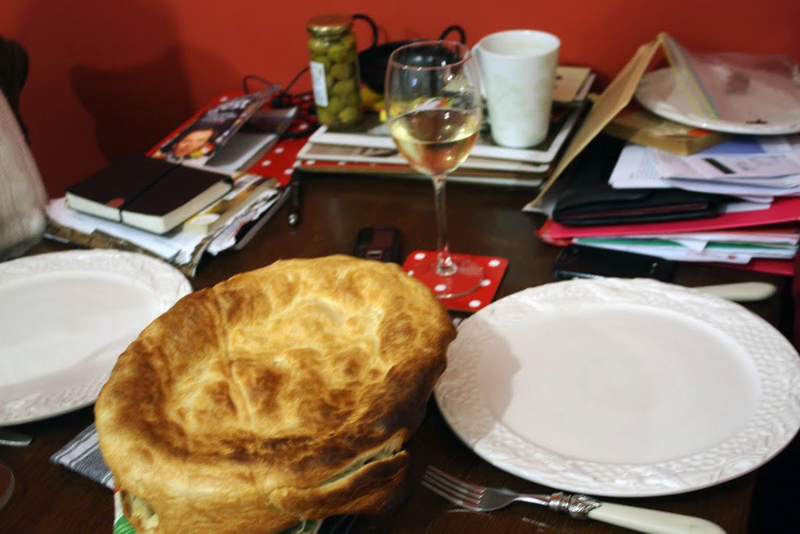 If you don’t fancy a bit of home-butchery, then use chicken breasts—1 per person will make an enormous pie—though you can easily get away with three breasts for a four person pie because there’s so much else padding it out. Before you start, slice the leek, chop the mushrooms and cut up the meat into 2cm cubes. Fry the leeks and mushrooms in a little oil, and then tip them into the pie dish you’re planning on using. 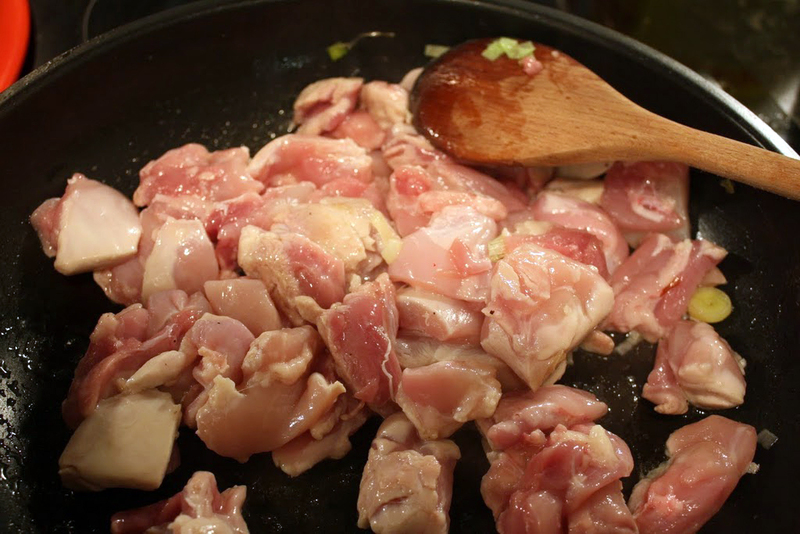 Next, fry the chicken pieces in the same pan—you don’t need to cook them all through, but keep them moving in the pan until all the outsides are white. This shouldn’t take any longer than five minutes. Once they’re done, pop them in the pie dish with the leek and mushrooms. Give the pan a quick wipe, then start to make the roux. 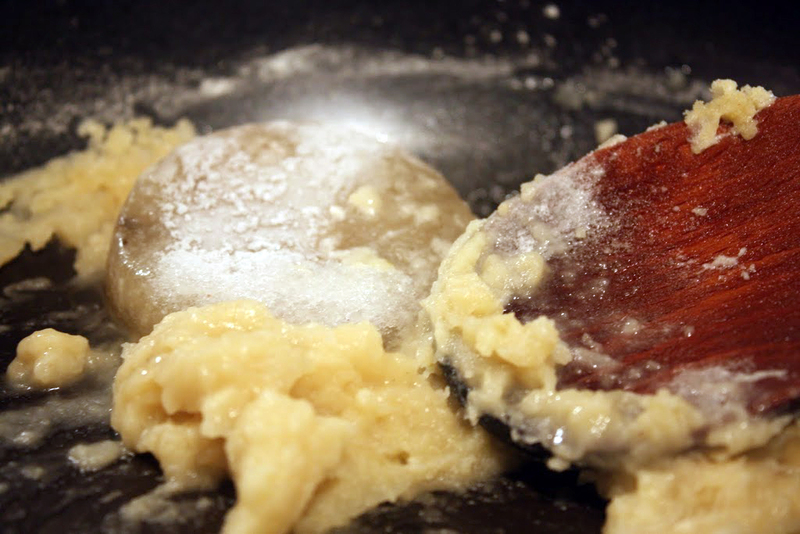 Gently melt the butter in the bottom of the pan and then add a couple of table spoons of flour and mix it into a paste. Cook the paste for a minute or so until it turns a golden-straw colour. If you’re using stock cubes, mix them with boiling water and start to pour it into the pan little by little, stirring furiously the whole time. 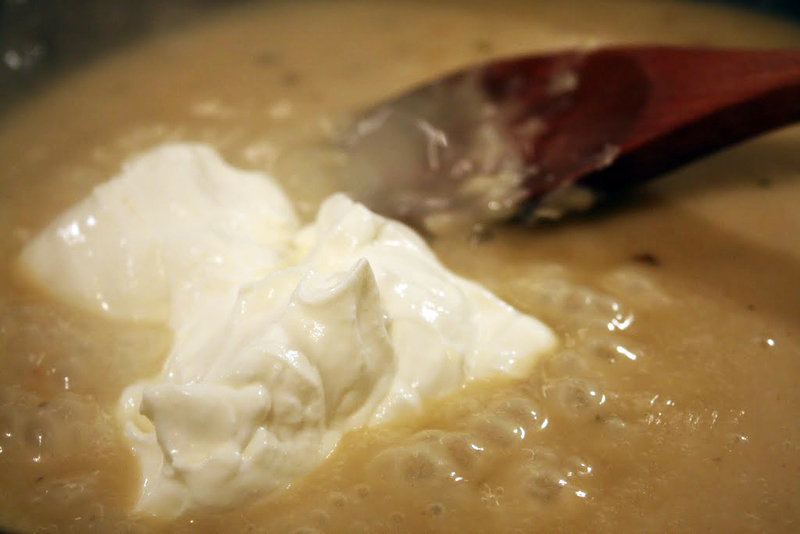 Add a generous couple of table spoons of crème fraiche to the sauce—this gives it a lovely creaminess without it being a double cream-based, too-rich sauce. Now pour that into the pie dish with the chicken, leek and mushroom and gently stir everything together. Agreed. That is a pity. 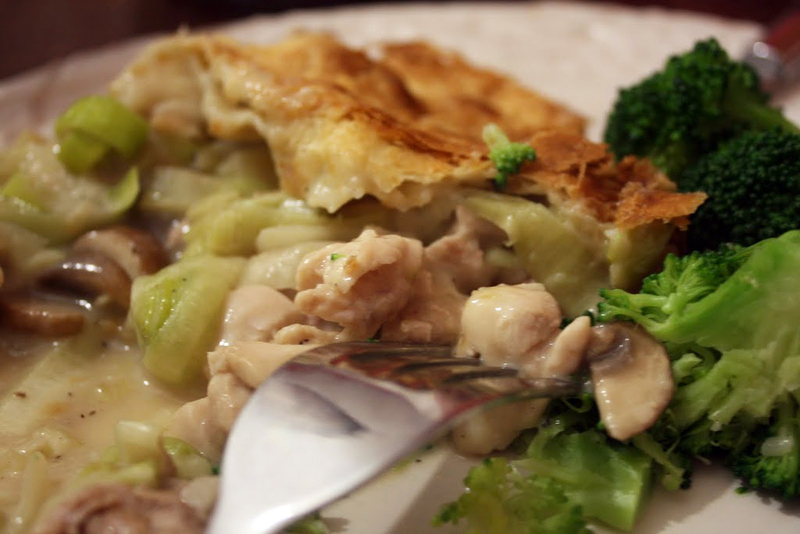 Would it be ok to have chicken skins floating around in a pie…? I suppose it would. Thanks Jenny—they’re staying on next time! Mmmm, chicken and leek, my fave!